3D printing has gained the maturity for industrial use in prototyping, design, advertising and art. We have the printers for Your BIG ideas. Want to see your work? We are always open to showcase your project. spans an impressive 1m x 1m x 1m. With a raised printbed that starts on eye level, loading and unloading is easy. 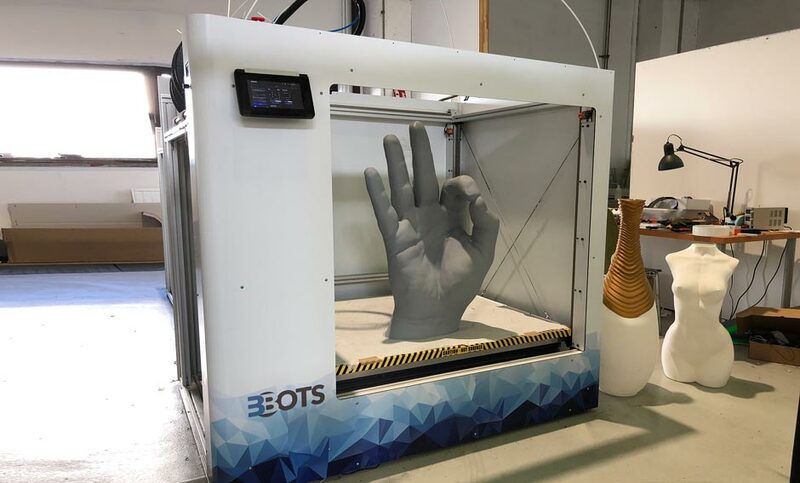 A precise Z-axis is the foundation of every perfect print. KONG relies on a unique Z-axis-control with four separately driven and synchronized ball screw drives. KONG is shipped with a unique dual extruder that enables the use of two different materials in the same print. gives full control and status monitoring options. Start and stop prints and execute all configuration and service tasks. KONG3D was designed with compact external dimensions. The narrow side measures 135cm, the long side (front) 165cm and the height ca 150cm. The hotend is driven by an XY- dual servo belt system, allowing highest speed, precision and acceleration. for temperatures up to 70 °C. The automatic bed levelling system makes sure the bed is always perfectly leveled. KONG3D allows you to use two 10kg filament spools, each actively driven and controlled. 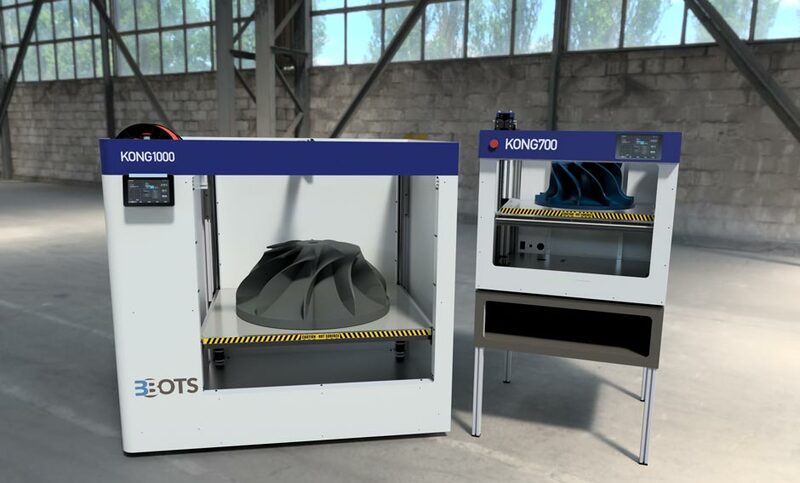 KONG700 is 3BOTS FFF medium format 3D printer with a build-volume of 1/4 m3 = 8.5 cubic feet. 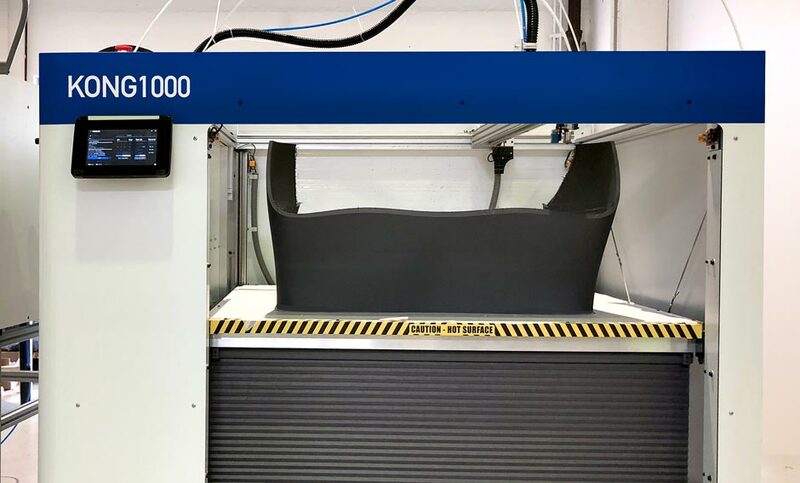 A solid solution for everyday printing applications, including vertical markets like molding, prototyping or packaging. allows for objects up to 690 x 680 x 490 mm. The printbed rises from top to bottom with easy loading and unloading. 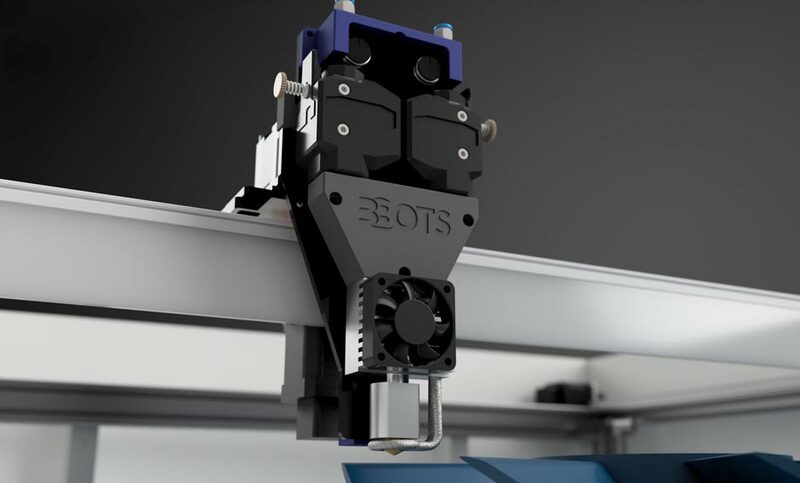 Two ball screw drives plus four linear bearings keep the printbed stable and parallel, a must for a perfect first layer. 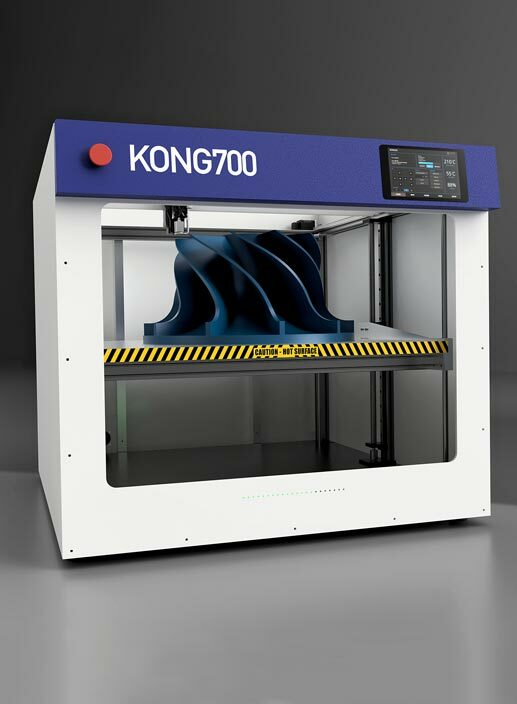 KONG700 is shipped with a unique dual extruder that enables the use of two different materials in the same print. at the front bar gives full control and status information. A light bar at the bottom front shows the exact progress of the print. The hotend is driven by an XY-dual servo belt system, allowing highest speed, precision and acceleration. for temperatures up to 100 °C. The automatic bed levelling system makes sure the bed is always perfectly leveled. KONG700 allows you to use two 2.5kg filament spools with filament flow detection. 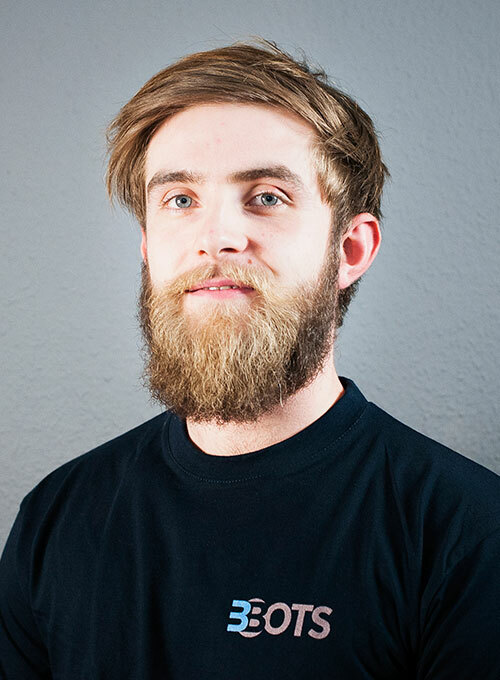 3BOTS is a startup from Berlin with a young but experienced team. 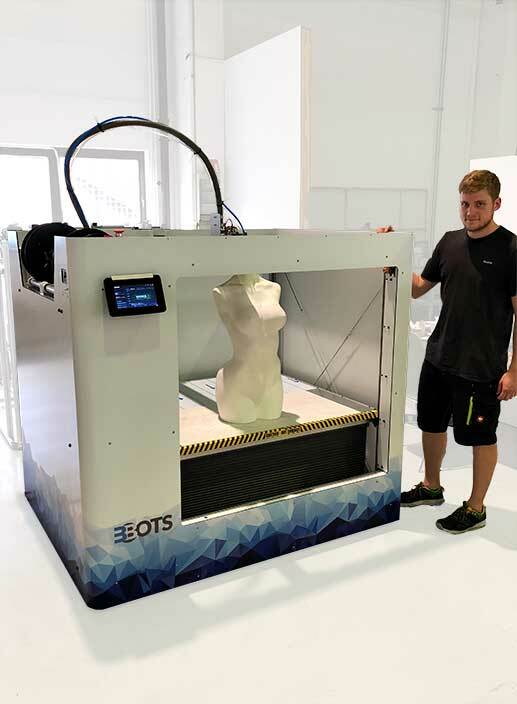 Our mission is to develop the best large format 3D scanning and printing solutions for industrial and artistic applications. We develop, design and manufacture our machines in Berlin. Our broad know-how always allows us to think outside the box. We construct conservatively but use modern tools and technologies to improve performance, weight, size, efficiency and speed. This helps to stay ahead. 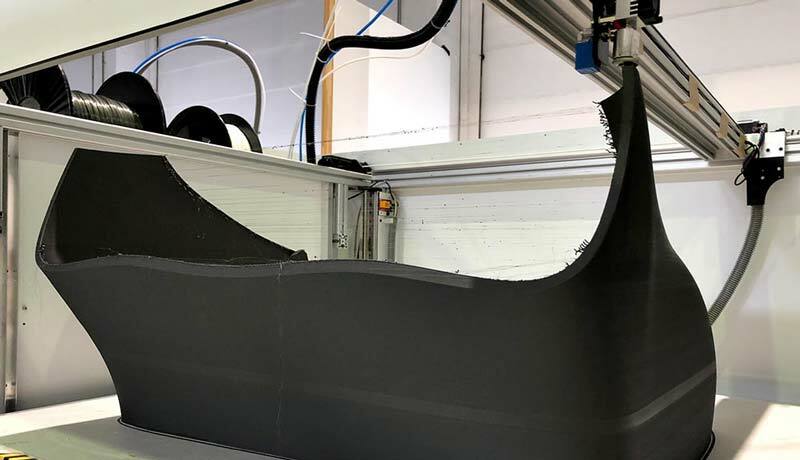 Speed and precision are everything in additive manufacturing. That's why we focus our attention on exactly these points. With each new system and every new development, we improve handling, accuracy and speed. You can profit from our ambition. In our systems we use open interfaces and open software. This is the only way to guarantee long-term maintainability, manageable operating costs and employees that can be used across all manufacturers. We also support you after your purchase. With advice and consulting. And training to build your own know-how. With consumables, software updates and enhancements - to continue to provide you with the best solutions in the market. 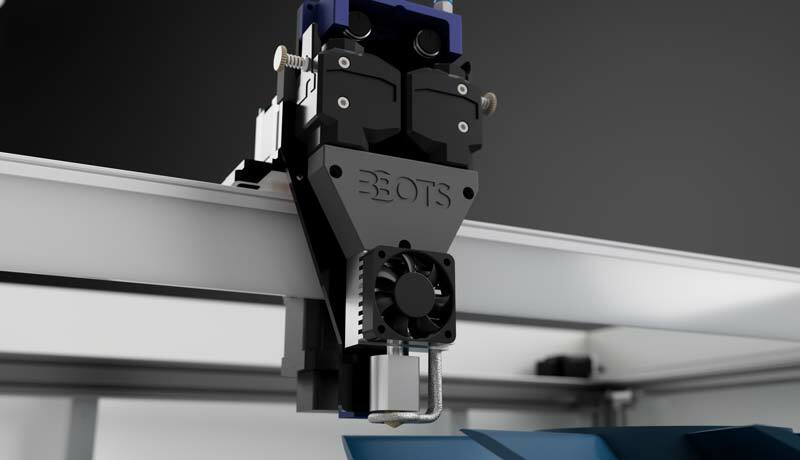 At 3BOTS we are a small development team with a clear focus on development and production of our 3D printers. Sales and logistics are outsourced. Currently we are working in the creative environment of motionlab.berlin, the premier hardware coworking space in the middle of Berlin. 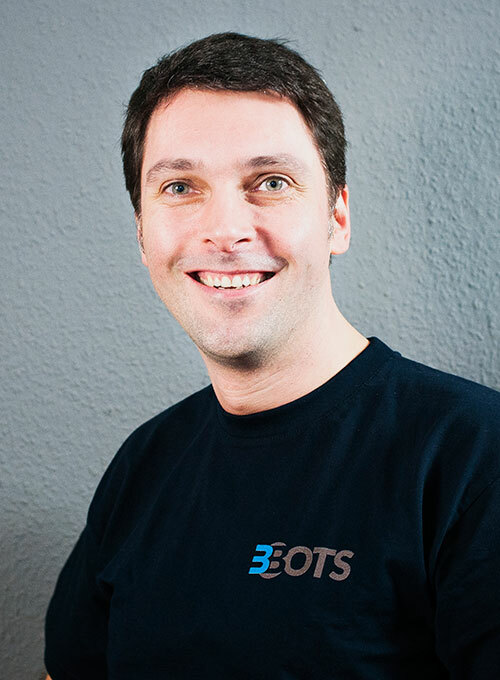 is the Managing Director of 3BOTS. He studied electrical engineering and has been responsible for development and product marketing of complex electronic systems. At the renowned print service provider jam-fineartprint he led the color management and art reproduction department. studied business informatics and afterwards was responsible for software development at Macron AG. In this role, he developed various special software for use in the graphic arts industry. Stefan supports 3BOTS with his sales experience. 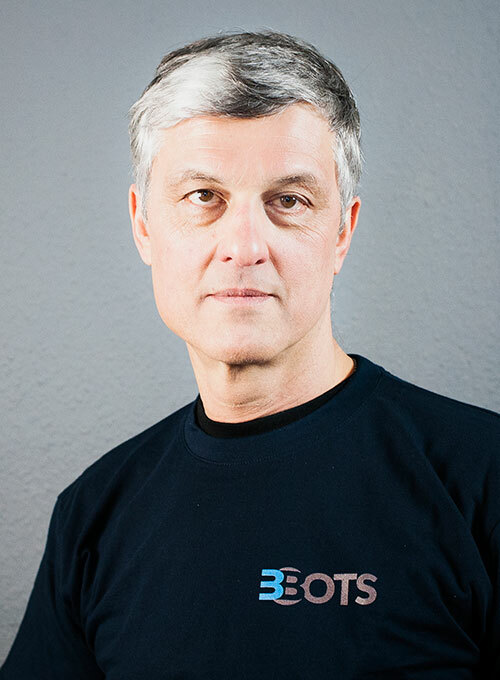 Christoph’s role is software development for 3BOTS. He supervises the conceptual planning of the software and develops mathematical models for the simulation of print parameters and mechanical influences. Christoph studies mathematics at the Freie Universität Berlin. has been working on the design of KONG since its first days. 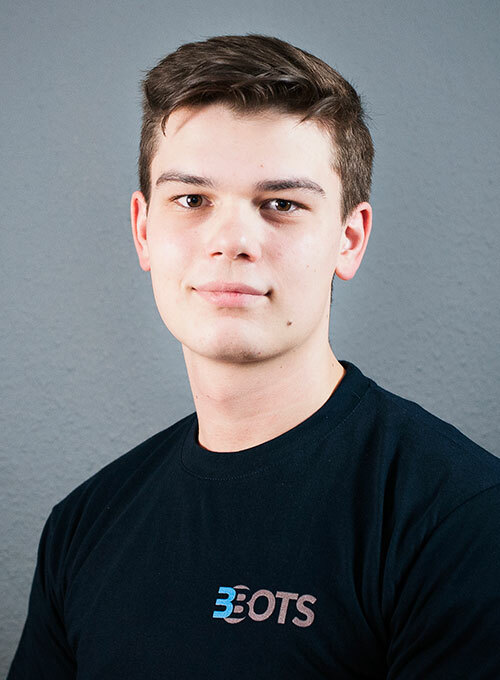 He studies mechanical engineering and is responsible for the mechanical design of our 3D printers. We're only at the beginning of additive manufacturing. This is the technology that builds our future. 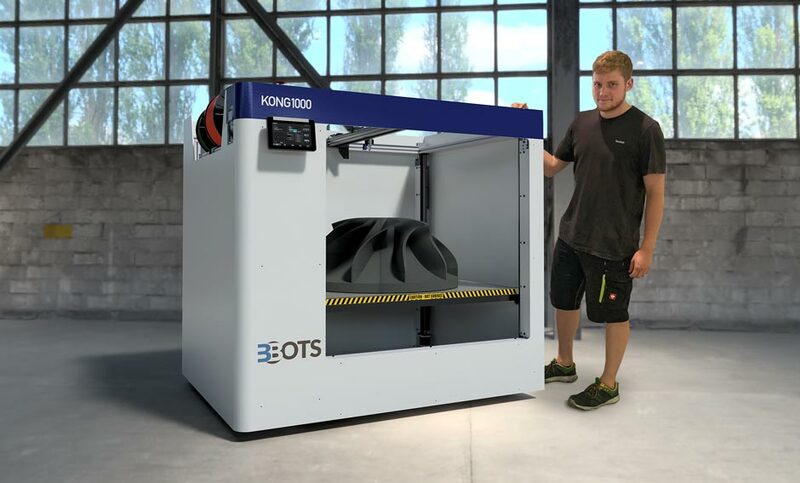 KONG offers us the room for for full-scale prototypes of injection-molding forms. This gives us an important competitive edge. When we first came to 3D printing, we had no idea what was possible already. Now we are using KONG3D as a central part of our design and decision-making process. See our Blog or visit us on Facebook to see what we are working on. Stay tuned for more info. 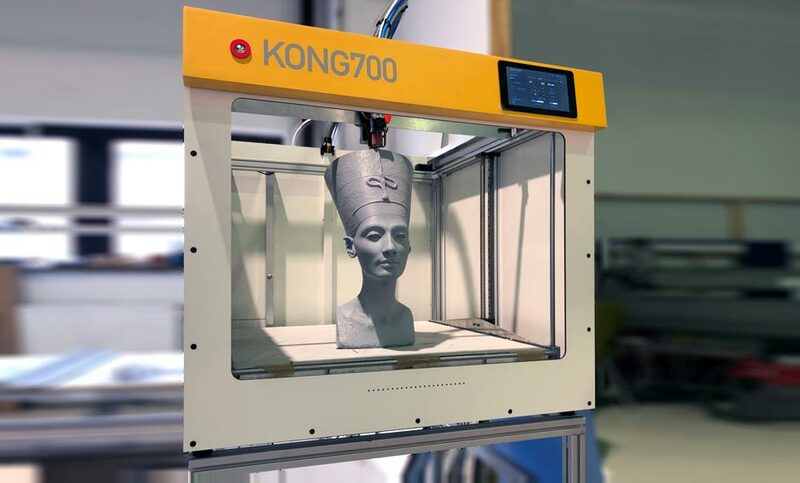 The formnext show 2018 in Frankfurt/M was a great success for our new 3D printer KONG700. 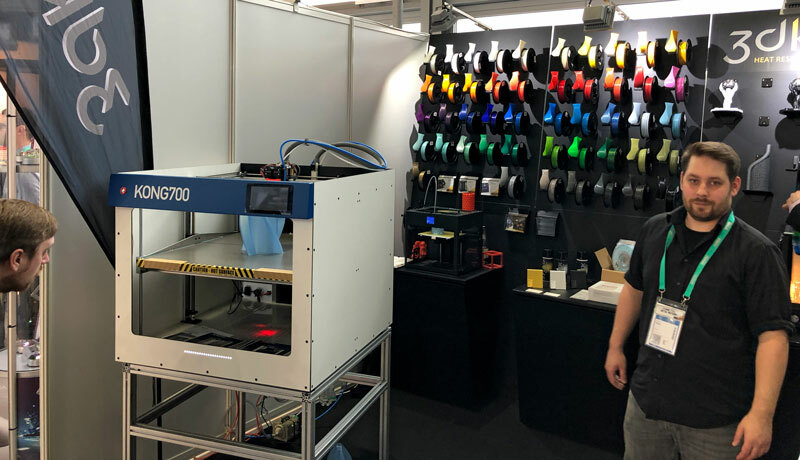 The printer was on display at the booth of our partner 3dk who is also manufacturer of the 3dk line of standard and specialty filaments. In the last month we have extruded lots of filament to test machines, filament flow and our extruders. We now have our advanced dual extruder, that incorporates all findings of the many structures we have printed.